Let’s face it, once you have children, holiday planning takes on a whole new meaning. But the good part is that resorts are now ensuring that there are enough activities to keep your kids occupied whilst you indulge in some much-needed R&R. These are some of our favourite ones to stay at with the fam. Check them out. This luxurious property offers everything to ensure you and your kids have a fun-filled trip. You guys can go sailing (or learn sailing with your kids at the sailing centre) or laze around in their swimming pools. They have Camp Hyatt for the younger children, where you can leave them for a fun day of pottery, crafts, scavenger hunts, yoga or dance lessons, whilst you enjoy an indulgent massage at the spa. They even have a casino for you to hit up once the kids are fast asleep. Or, you know, you two could just take a moonlit stroll on the tranquil beach. If you are an outdoors-loving family, then Olaulim Backyards is the perfect eco-resort for you guys. Nestled on the backwaters, this is the place to really kick back, bond and get introduced to susegad. Savio, his wife and kids (plus a menagerie of animals) will welcome you and there are always the individual cottages with a huge outdoor pool to relax in. You can take walks, go cycling or even take a kayak or canoe into the backwaters. Teach your kids to fish, spot different kinds of birds, and if you visit in the monsoons, watch the peacocks dance. Doesn’t this sound perfect? 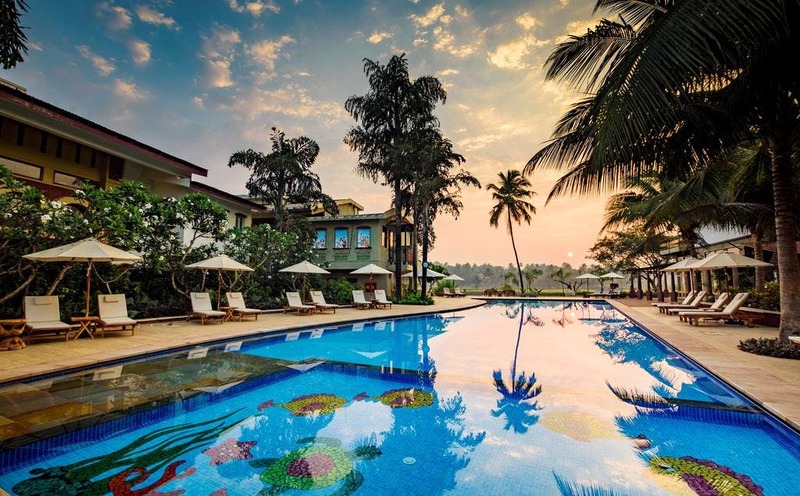 This one’s certainly one of Goa’s best resorts. This stylish hotel comes with luxurious facilities to make your fam's stay comfy and indulgent. And you can leave your children or toddlers below six in a centre with trained staff and clean surroundings, without a worry. They also have a Teen Zone for older kids where there are video games, table football and comfy beanbags. Additionally, they organise activities and regular movie screenings at their in-house theatre. All sorted then? Located right on the beach and at the foot of the famous Aguada fort, this beautiful villa-style resort is luxurious and exclusive. It hosts a separate playing zone for kids and even has a kids-special restaurant serving their favourite dishes, albeit cooked in a healthy way (happy now, mom and dad?). They also host activities, and with a bar inside one of the pools, you folks can even spend a day there, splashing, drinking and keeping the spirits high. Not a water baby? You could always walk along the fort wall and watch a beautiful sunset, and who knows, you might just end up seeing a dolphin or two? If you are looking for a more budget-friendly option, Granpa’s Inn also known as Hotel Bougainvillea in Anjuna, is a great place to stay. A family-run hotel, that is housed inside a renovated 200-year-old Portuguese villa and comes with a large pool, cute rooms, a huge garden and an open area for the kids to run around. They also have kid-friendly food on the menu. Interestingly, the owner is actually a cute grandpa who the kids will love! P.S. Special mention for the adorable dog that brings all the kids to the yard. Sweetly tucked away in Siolim, away from all the tourist madness but close to the beaches, Ziva combines the comfort of a hotel with personal attention. Their rooms are child-friendly with none of the ornate, elaborate artefacts to stop the kids from having fun! They all have a TV and some of them are made to accommodate a family of three/four with extra beds for a comfy stay. There's a pool and a kid's play centre that can be set-up on demand. And oh, they're happy to let you karaoke or play your favourite movie at their home theatre. To add to this, you don't even need to step out for meals if you're too tired from all that swimming – the restaurant does great meals with breakfast, lunch thalis and dinner (yes, they've also got a bar for them parents to have a good time). By the way, Thalassa is walking distance in case you want to enjoy a stunning sunset. This massive 45 acre, beachfront property has private beach access to Arrosim beach and meandering pools spread across the landscape. It's as stunning as it's family-friendly with sprawling lawns, a food court with a choice of restaurants and in-room dining. There's even a designated kids' play area where they can have fun with games and interactive activities under the watchful eyes of the trained staff. While the little ones enjoy pottery, arts and crafts or their favourite cartoon series, the parents can go jet skiing or sign up for a couple's massage at the gorgeous Kaya Kalp spa at the hotel. This boutique resort in South Goa is all about slow living...Sand castles on the beach, stroll in an organic garden, a long soak in the pool and hours spent on outdoor swings kind of slow. While the parents can get back to day drinking at the bar, the kids can be engaged in a pizza-making class and perhaps, you guys can then all go for a guided nature walk where you point our rare birds and watch the sunset. Their special kiddyland with slides, tunnels and swings just about got done and we see that they offer babysitters too! What's stopping you now?